This book is incredible. It features a bucket list of the best and most beloved holiday films of all time, complete with spirited commentary, behind-the scenes stories and photos spanning eight decades of Christmastime favorites. Have you always said that "Die Hard" was a holiday movie? Well now you have proof! It is on the list! Nothing brings the spirit of the season into our hearts quite like a wonderful holiday film, holiday films come in many shapes and sizes and exist in many genres. Some, like "It's a Wonderful Life" and "A Christmas Story" are perennials. Others such as "Die Hard" have only gradually become yuletide favorites. But they all have one thing in common they use themes evoked by the holiday period: nostalgia, joy, togetherness, dysfunction, commercialism, or cynicism, as a force in their storytelling. Turner Classic Movies: Christmas In The Movies showcases the very best among this unique strain of cinema. Each film is profiled on what makes it a "Christmas movie," along with behind-the-scenes stories of its production, reception, and legacy. They are complemented by a trove of black-and-white and color photos, Turner Classic Movies: Christmas in the Movies is a glorious salute to a collection of the most treasured films of all time. Among the 30 films included are: "The Shop Around the Corner", "Holiday Inn", "Meet Me in St. Louis", "It's a Wonderful Life", "Miracle on 34th Street", "White Christmas", "A Christmas Story", "National Lampoon's Christmas Vacation", "Home Alone", "Little Women", and "The Nightmare Before Christmas". The author, Jeremy Arnold is a film historian and commentator. He is also the author of Turner Classic Movies: The Essentials and Lawrence of Arabia: The Fiftieth Anniversary. He lives in Los Angeles. 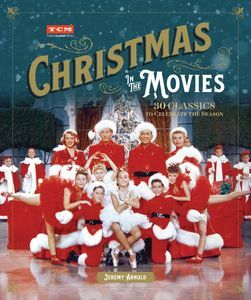 Turner Classic Movies: Christmas In The Movies has 208 pages and originally retailed for $22.00. Currently it is on sale for $16.95. It will make the perfect gift for any film buff that you know. Like TCM on Facebook: https://www.facebook.com/tcmtv and Follow TCM on Twitter: @tcm.